Instructions: Stamp Poinsettias from the Poinsettias and Holly Clusters set and Sparkling Poinsettias in Black. Cut out with corresponding dies, sponge with Garden Patina and Fern Green and sculpt the Poinsettias and Holly Clusters with the 3D Poinsettia Shaping Mold, see video for directions. Sculpt the Sparkling Poinsettias with the Flower Shaping Essentials. Add yellow prills to centers of the small poinsettias, sponge the centers of the Sparkling Poinsettias with Buttercup and adhere to center and add Rajni Chawla's Frosting Powder. Stamp and sponge the holly from the Large Sparkling Poinsettia in Fern Green, and cut out with corresponding dies. Stamp the boughs from the Snowy Pine Village and the sprigs and pinecones from the Merry and Bright Accents sets in Rich Cocoa. Cut out with corresponding dies. Sponge the boughs with Fern Green and then sponge around the outsides with Library Green. Sponge the pinecones with Creamy Brown and around the outsides with Rich Cocoa. 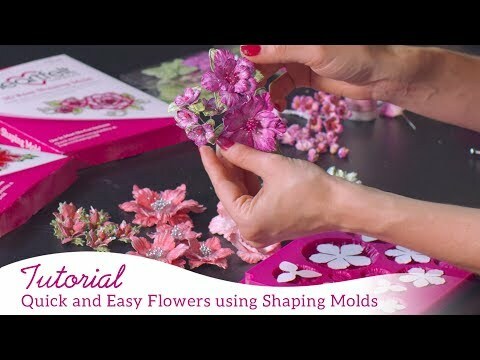 Sculpt with Flower Shaping Essentials. Stamp the snowy branch from the Window Box Fillers set in Black and color with a brown pencil (Prima used here), cut out with corresponding die and sculpt. Stamp snowman from the Frolicking Frosty set in Black and color with Zig markers. Stamp gate from the Festive Gate set in black and sponge with Creamy Brown. Stamp racoon, birds, small trees from the Woodsy Critters set in black and sponge. Stamp and sponge trees from the Snow Kissed Spruce set and sponge in Fern Green and Library Green, cut out all images with corresponding dies. 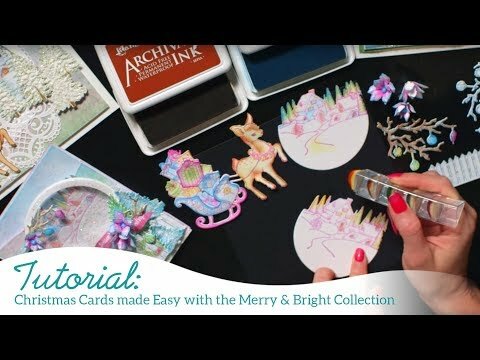 Create a card base that is 6 x 5.5 inches, cut out mat in black cardstock that is slightly smaller and a piece of blue paper from the Merry and Bright Paper Collection that is slightly smaller than the black, cut out the circles in the center with the Eyelet Circle and Basics Small and Circle Basics Large Die and add an Eyelet frame to the outside by cutting out the Eyelet die in white, adhere to a panel with the pink house with foam tape. Distress and adhere all to card base. Adhere all images as shown. Add sentiment from paper collection in among the poinsettias on the left. Sponge glue on boughs and pinecones and cover with Frosting Powder.